K2. 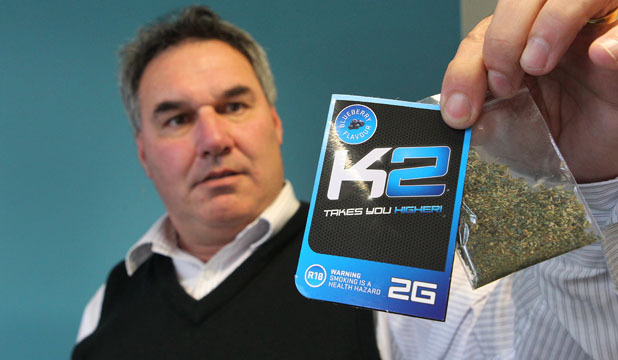 (I assume that is short for Kronic 2… the synthetic variant of THC in ‘kronic one’ having been banned.) Is this the packaging of this stuff available in New Zealand? I don’t know! I have never actually seen a packet myself. What is interesting about this photo is the clear R18 age restriction voluntarily printed on the packs by the distributors, which is a prudent and socially conscientious thing to do, showing that contrary to all the hypocritical claims of ‘drug panic’ merchants who are busy ripping their shirts over the availability of legal highs… the fact is that the distributors have no desire to peddle their wares to children, and that any shop keepers doing so are violating the express conditions of being vendors of this product, and could be/ should be sued by the K2 distributors. All Legal highs should have such R18 age restrictions on sale and purchase… just like Alcohol. And as recreational drug use and prohibition is an important subject to Libertarian minded people like myself, I hope to present the group with alternative arguments to prohibition… in the interest of society, Justice, and harm minimization. It is not my intension (today…in this group) to cause trouble, or to be a Gadfly. I enter this group in sincerity believing I have a valid position to put forward and can contribute value to this discussion. I have blogged about Internet trolling before Here:, , and though I now need to do a follow up blog post confessing my realization of the reality of malicious predators whom do indeed stalk the Net seeking to cause Chaos and disorder, that in no way is this my intension in joining this group. handed laws and prohibitions, refusing to appreciate that such an approach has proven to be an absolute failure time and time again, and that the draconian nature of Prohibition is actually far more harmful to our society… esp to the youth who become criminalized and thereby alienated from our society… not for any acts of dishonesty, or violence, but because they have been caught with a small bag of ‘happiness’ in their pocket. These young people know that they have been unjustly treated, because they know that many of those whom have brought the Law down upon their heads, including the majority of the Police who break down their doors, and ransack their homes, and drag them off to the cells… all drink Booze… beer, wine, and spirits, until they cant even walk! I would like to present a counter-argument to prohibition as a means of minimizing the harm of drugs upon our society, and discuss why I believe having a legal yet age restricted market for recreational drugs is a far better means of controlling drugs… just as we have with alcohol… and for the very same reasons. Alcohol prohibition was tried,…and was dismal failure! Though we still have big social problems with Alcohol, people still need to appreciate that having legal supply of alcohol is still much better than the evils of Prohibition. For starters it is much easier under a legalized system for people with problems to go and get help, from places like AA, without fear of being prosecuted, or losing their jobs, etc. This topic is also a lot like xenophobia and the witch craze, in that wild stories grow up all out of proportion to reality, fueling a lynch mob type hysteria. Anyone familiar with the history of prohibition knows this classic phenomena. It is a manufactured frenzy, purposely propagated by the prohibitionist lobby and their Populist politicians who think nothing of feigning Piety and social concern, by promising to crush an unpopular minority for the sake of getting elected. Corby Schapelle. Imagine for a moment this is your adult child behind bars… not for robbing or harming anyone, but simply because they were found with a drug which was not alcohol. This is the real ugly face of the injustice of Prohibition… which utterly fails to stop recreational drug use. It merely serves as a disgusting means of inflicting a Nazi-like bigoted hatred upon an unpopular and demonised minority. The Nazis swore their persecution of the ‘Socially deviant Jews’ was completely justified. Vicious bigotry always hides beneath a Cloack of ‘Righteous indignation’. Though I don’t dispute that drugs (like alcohol and cannabis) ought to be kept away from children, and that adults too need to take care how and when they use such substances, I have little doubt that the fears about the harmful effects synthetic cannabis will prove as groundless as the Nonsense which fueled and maintained Cannabis prohibition. Cannabis is now being legalized across the globe because of it’s ‘Health benefits’ and medicinal qualities! It is ironic to understand that for thousand’s of years Cannabis was known and appreciated for it’s manifold beneficial qualities, and that the folly of prohibition of cannabis is itself a *modern phobia*… thankfully this terrible era of prohibition is coming to a close. It is interesting to consider the fact that if we had already decriminalized Cannabis that we would not be facing the wave of new synthetic substances like K2! And this fact in itself also reveals why Prohibitions are absurd. Ie because there is a demand for recreational drugs… some innovative people will always figure out an new way to get high, and undoubtedly some these ways will be far more dangerous than cannabis! Thus Prohibition tends to endanger our youth because it has outlawed safer alternatives. Below is a blog post I wrote the other day on this subject and I will produce more as this debate unfolds. I ask members to seriously consider the counter arguments to prohibition if you claim to really have the interests of society at heart, and not be simply driven by a personal bigotry against drug users. My Pamphlet on BZP… having legal alternatives to Alcohol… Click >>> Historic battles. The Libertarian struggle against Drug Prohibition. Why BZP should have been kept Legal. Read about how New Prohibitions. How our Police and Government work for Criminal Gangs. It appears that after One day, One post, and one reply (in support of Mr G) I have been ‘Fed to the sharks’ by the SOCIALISTS running the facebook page ‘K2 and other ‘Legal Highs’ in New Zealand. We all need to know the dangers’…. which completely vindicates my acustaions that the ‘Anti-everything lobby’ are so fanatically in favour of tyranny, that they will not even consider any alternative arguments to prohibition… in the interest of society, Justice, and harm minimization. It was interesting to see that indeed my input was not recognized as a legitimate contribution to the discussion, but instead….because I am Anti-prohibition… anti- drug phobia… they chose the low road… the easier path which was to deem me to be ‘a Troll’… and thus….rather than openly debate me….. to simply ban me instead!, and forbid Group members from being able to message me! A Chorus tunned in… “I imagine that the one thing we learn from history is never to be dictated to by anyone using the term “you people”. When you say we don’t have the right to ….do this or that… tell us– what gives you the right to say that? What authority was endowed to you to authoritate over all the “you people”? You don’t want us to ban? But then you would ban us from banning obviously. I hear the ring of Nazism when I hear “you people should”… when I hear hard-loaded words like “bigoted idiots”. “First, fascists, please. We don’t hate Jews. I was a Pressure cooker ready to blow! This is the sort of *Brain Dead Zombies* who in large numbers ‘mandate’ the Nanny State Jihad on Drugs! They are so stupid as to think that saying ‘they loved the Jews’…was a relevant retort to my accusation of Fascism! And of course they had to raise that old specter ‘Refer madness’… “Damaging young minds” etc. That summoned the Group Captain to write a reply telling me I was out of line…Blar! Blar!, etc. I have removed myself from your Group XXXXX, I refuse to ‘tone down’ my contempt for those Nazi’s who perpetuate vile legal State oppression of Cannabis Prohibition and the ever expanding prohibitions on such things as synthetic Cannabis. I think it is you who needs consider the fact that you censured me for pointing out their Grotesque and inhumane politics! I would have stayed any and battled this issue out with them, yet I would never have softened my position, and so because it is your page and you make the rules, I had no choice but to leave. It may be news to you that the average ‘Nazi’ in the Early 1940’s were not all physically/ personally swimming in the blood of the Jews. Most of them never set foot inside a concentration camp… they left that for the Military and the Police. Oh no they considered themselves ‘Decent Law abiding people’ …. Patriots of the Fatherland, and took holidays at the beaches which their troops ransacked Europe and rounded up and Shot Jewish Families in the occupied territories. Yet they were as guilty as those closing the doors on the gas chambers because they gave Hitler their mandate to run his ‘final solution’, and to round up the gypsies, and anyone else these ‘decent folk’ thought were a source of Social mischief. Yes This is definitive Fascism, and Your Friends have made ‘Jews’ of peaceful recreational drug users… and are busy working our society into a frenzy so as to vindicate extending their evil political oppression… no matter how unjust…. Or what the cost. XYXYXY did not even bother to read my post before he wrote that selling Synthetic cannabis was ‘Culpable manslaughter’! And you have the audacity to pull me up for holding him accountable for such a *Fanatical statement* !!!??? I am sorry but I want nothing more to do with your group. So much for having a rational discussion (on that page at least!) These Nazi’s vindicated the first Paragraph of my Blog post to a tittle. This was not the K2 face book page I mentioned in my blogpost, but it demonstrates the Damnable blind ignorance and bigotry we must overcome to put an end to Nanny State socialist tyranny…. I have had a guts full of this sort of Nasty small minded bigotry and persecution mentality! I believe K2 (“takes you higher”) is named after the Himalayan peak K2, the second highest mountain on Earth. Good theory, though, and I look forward to K3! It was interesting to see that indeed my input was not recognized as a legitimate contribution to the discussion, but instead….because I am Anti-prohibition… anti- drug phobia… they chose it easier to deem me to be ‘a Troll’… rather than openly debate me….. and ban me, and forbid Group members from being able to message me!